A view from the RSPB bird hide at Gruinart in November 2014. 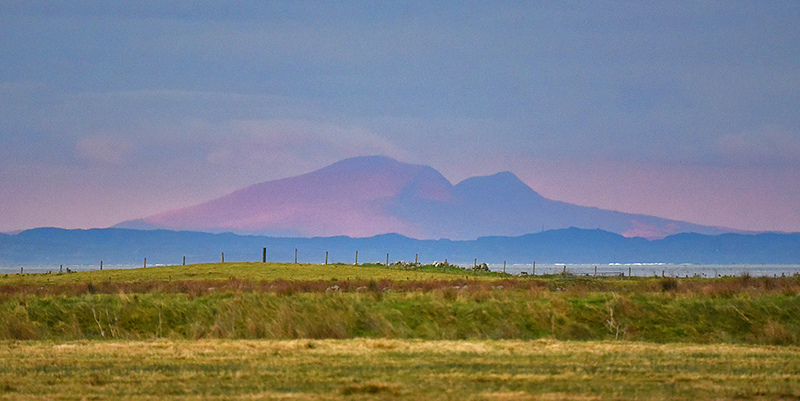 For a brief moment Ben More on distant Mull was visible in a reddish hue, some time around sunset I think. The darker stretch in the middle distance is Colonsay. This entry was posted in Cloudy Weather, Landscape, New Post, Sea Loch, Sunset and tagged Colonsay, Gruinart, Islay, Loch Gruinart, Mull by Armin Grewe. Bookmark the permalink. @islayblog Wow, they look so close, I presume some sort of zoom was used? @sister_ratched yes, the big 80-400mm zoom came out for that one. And a bit of cropping. Looks like a romanticised Disney backdrop. But it ain’t.